Java Developers can actually develop Rich Web Applications just with the basics of some programming if they use the ZK Ajax Framework. The event driven model and server centric architecture of the ZK Ajax Framework makes it easy to develop web applications as instinctive as it is programming desktops. With near about more than 170 Ajax Components & a Mark Up language it is easy to design rich UI’s just like it is with authoring HTML Web pages. ZK Ajax Framework will render more dynamic and flexible mechanism for acquiring Data binding, Data Accessing, Variable Resolver and Annotation devoid of having to declare a separate manage bean in the configuration. With the latest release of ZK Ajax Framework the web developers can as well combine the Java Bean into an Ajax Spreadsheet App. This amazing functionality and technical break through with Ajax Framework has brought in a new era to web application development with Ajax. This framework is an Ajax+ Mobile Framework that is meant for maximizing enterprises operation efficiency and will reduce the development cost. 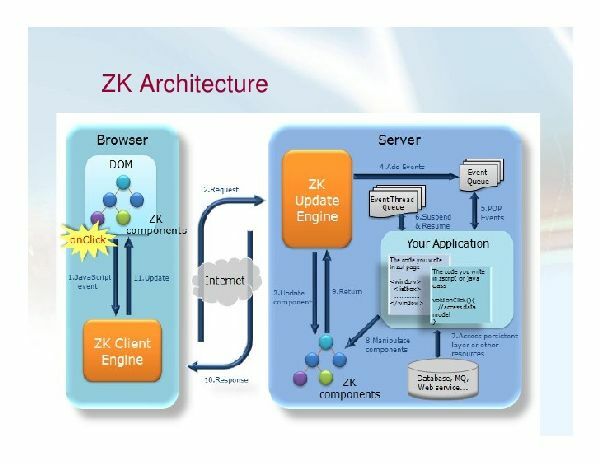 ZK Ajax Framework has an innovative Direct RIA Architecture thus will speed up the process of development, deployment, support and maintenance of Rich Internet Web Applications. As this framework allows access to programming databases & enterprise resources directly , the web developers need not worry much about the exposure of business logic to the customer and as well need not worry about the exposure of business data on the web. Why ZK Ajax Framework ? ZK Ajax Framework makes use of XUL i.e. XML User Interface Markup Language. It is easy to learn with Active & Large Community. There are new releases every 2 months. Ajax is used for synchronization with the server or client. Cross Browser , Web Based Java OS. Desktop Metaphor with Web Browser. You can integrate it with Spring or Hibernate. Component Based Event Driven Model. ZK makes use of the Bean Shell. 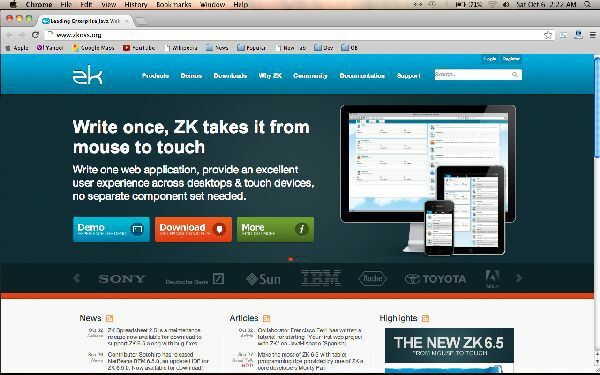 ZK scripting is supported within a separate ZScript file , Java Packages and a zul file. Modifying Default Style sheets with ZK Ajax Framework is not that easy. Wide-ranging set of user interface components. Scripts to Java if too slow. You can quickly prototype with the use of scripting. Synchronization is supported with client or server. For complex pages Bean Shell scripting will become slow.